Sepsis is a major cause of mortality in the UK, and takes more lives than breast and bowel cancer combined. Sometimes known as septicaemia or blood poisoning, sepsis can affect several organs without blood poisoning occurring. The process starts with an invasion of bacteria from an area of infection. The body normally responds with inflammatory and anti-inflammatory activities, but in sepsis there is an over-reaction of the immune system. Cytokines are released to kill the bacteria, but can also attack the patient’s own cells. 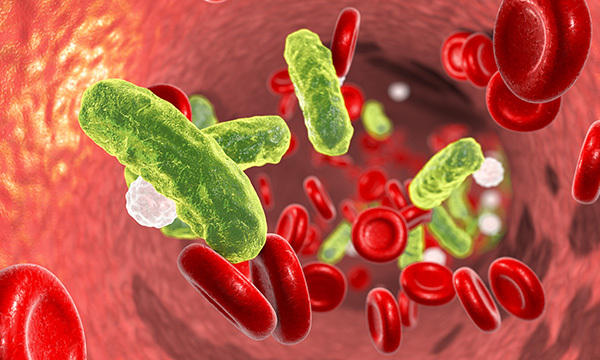 Signs and symptoms of sepsis include abnormal behaviour, altered levels of consciousness, pyrexia or hypothermia, tachycardia, hyperventilation, non-blanching rash, nausea and vomiting, diarrhoea, and muscle pain. An important sign is hypotension with systolic blood pressure ≤100mmHg. Patients at risk include those over the age of 75 because their immune systems are less effective and those who are immunosuppressed, such as people with cancer. People with long-term conditions, such as diabetes, and those with invasive devices, such as urinary catheters and gastrostomies, are also at risk. The symptoms of sepsis can develop rapidly and it is vital that nurses can recognise red flags, such as hypotension. It is also vital that they call for urgent medical help so that antibiotic treatment can be commenced before the situation becomes life-threatening. Jones J (2017) Managing sepsis effectively with national early warning scores and screening tools. British Journal of Community Nursing. 22, 6, 278-281.